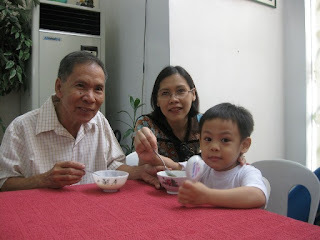 In celebration of Grandparent’s Day, Justin’s school invited all grandparents (whose grandchildren are studying in the same school) to come to their school during class hours to spend time with their grandchildren. Grandparents and grandchildren were treated to a bowl of heartwarming homemade soup. This entry was posted in Grandparent's Day, Nursery. Bookmark the permalink. You know what magkaka-hawig kayong tatlo. 🙂 Mabuti may malapit na Grand Dad si Justin. My father in-law kasi malayo eh they live in General Santos. Tatay ko naman missing in action. BTW, sis thanks for the 1000 EC that you pledge…Madali lang pagtransfer sa credit..Whoever will win will come here in your site and tell you that he/she wins, then you'll visit back his/her site, find his/her EC widget, click the "E", you'll be led to his EC account, sa right side my label na "Give credits to this site", jan mo iclick then you can send the EC…. same here tsang, I heard that grandparents day in other post, but never knew na may ganun pala sa atin. Ang bait naman ni justin mo tetcha. Happy Grandparents day cool GP.